2) Give adults something to do too! 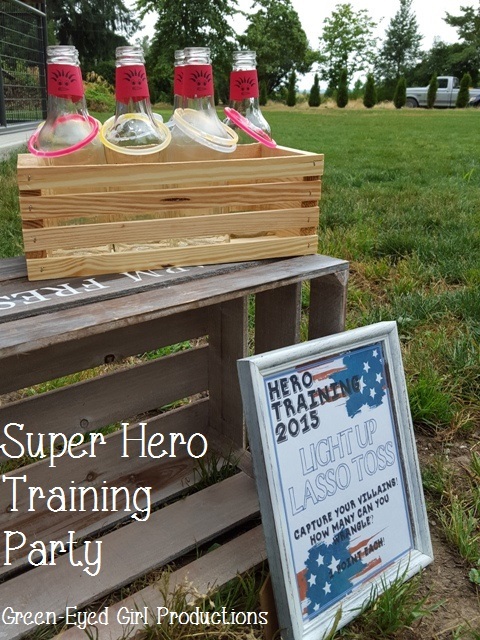 My definition of “training” actually implied that adults had to take a “hero” through the course and see what they (the adult) could score with their hero. The winner would then be the adult who trained the best hero. I made up score cards and adults got to make up their own names. The course was set up sort of like an obstacle course in a fan shape with a central pivot so that toddlers were contained and never running through or behind a thrown object. Station #1 Light Up Lasso Toss! Wonder Woman’s famous lasso (glow stick bracelets) hand to be tossed onto repurposed soda bottle “villains” and you got points for each you could wrangle. I simply printed a clip art face on red paper from my home computer and wrapped it around with tape. Station #2 Sticky Spider Webs! Spider-Man would be proud! I had originally planned to use ping pong balls for this but when it came time to set up and practice, they didn’t stick. They boys and I eventually figured out that the best option was, in fact, rolled up pieces of masking tape (the same I had used to make the webs) so that you got a double stick factor. 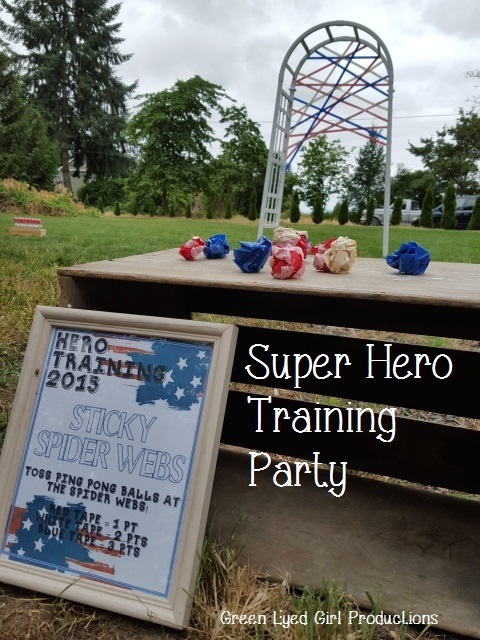 For this training, if you stuck to a red, white or blue “web” you got a certain amount of points. What toddler doesn’t like to throw things? Station #3 The Lance Launch! I reverted back to Camelot heroes for this one! Using some Sheppard hooks I suspended 3 hula hoops (from the DollarTree) that I covered in the same R/W/B masking tapes as the Spider Webs. 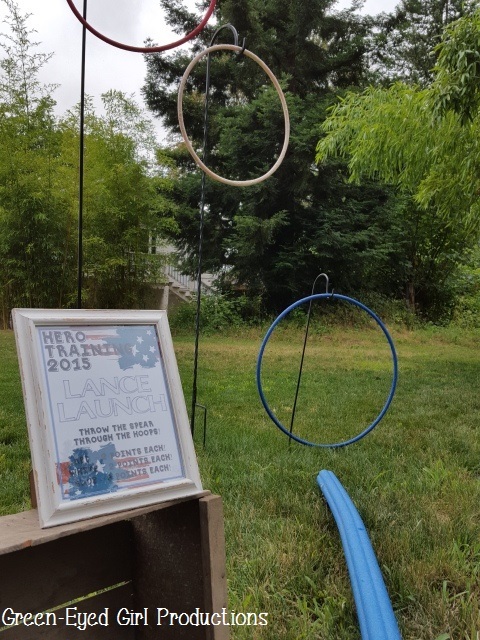 Using a pool noodle (DollarTree again) you had to launch the “lance” through a hoop. You got more points for the harder colors. Next came a Good Ole’ Captain America quality and flinging a shield at some targets. We had the cinder blocks laying around in the yard already so that worked out. I got cheap stacking cups at Walmart ($0.97 for the 4 per color), 3 Frisbees were also $0.97 each. I printed some Clipart to size and just used clear tape to attach the paper print out to the Frisbees. 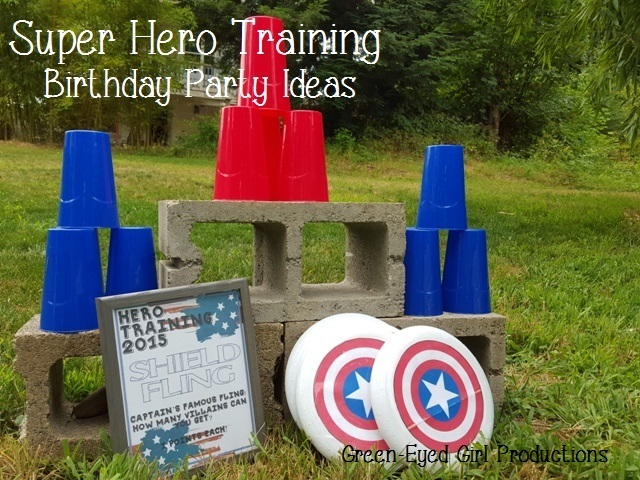 Super easy and probably the party favorite! 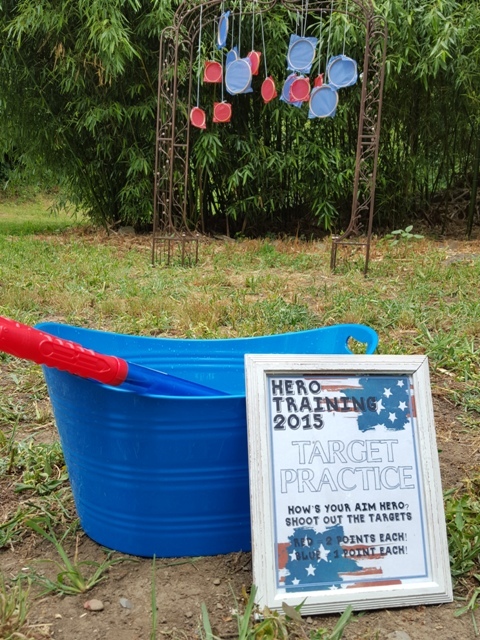 Finally, we ended the training circuit with Squirt Gun Target Practice. This was probably the most complex set up as well as the most…. errrr… not worth doing again. I used embroidery hoops to hang tissue paper, which I had to cut to size and it took a lot of time. The kids then weren’t strong enough to use the water gun to break the paper. OR, one squirt busted them all… so over all, this idea is probably a bust for how much time it took for little entertainment value. Live and learn!